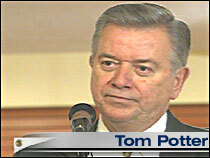 Portland’s Mayor Tom Potter recently spoke about his intentions to provide a very generous gift of a tax to the Portland Public Schools. (Potter’s Outline here and FAQ if your curious where the news outlets are reporting from). Check out the coverage and then look at the press release from the city. But all these sources overlooked what this gift to the Portland Public Schools really is – a trojan horse. Reforming Portland’s City Charter has been something Potter has been talking about since on his campaign soap box. But this reform is seeming to pop up hidden behind the hostage of schools (very SEIU of him). The City Council must pass a resolution authorizing a vote to change the city charter to allow the tax on February 22nd. A friend of mine attended and mentioned that Potter was obviously very careful in his speaking avoiding many specifics about his plan for schools. What he did discuss was the need for the City of Portland to be more free to raise monies when necessary for community services. I’ve looked everywhere to find evidence of what exactly Tom Potter said but I’ve found nothing on PortlandOnline or the general media outlets. What is this Charter Change that will be required? My guess is that Portland is about to permanently empower itself to levy an income tax under the guise of a temporary Public Schools tax. Get ready, something tells me Portland may be about to stitch up its plan to deal with unfunded pention benefits and guess what? It’s your pay check. I’m jumping to a conclusion but fortunately its a safe one given Portland’s histroy. “The City that Works” supposedly needs more leeway in it’s ability to nickle and dime the public and this is their open passage.